prima facie presumption doesn't mean a damn thing. If only you knew how funny this statement is. Look, all it would take is for a Hawaii official to go PRINT a BC for him. That's it! Just print the damn thing using a LEGAL template. It could also have been completely fabricated like the Kenyan one was. If that guy could make HIS BC look like one from Kenya with Obama's name on it, then this Hawaiian one would be a piece of cake considering there are NO signatures on any of it. Also, why is the BC number blacked out? Could that be because it is fake and that's the only way you could tell? What if that BC number was cross checked in the database, would it come up blank? Why is it blacked out? No reason for it to be. Again, proves nothing, does not constitute evidence. From your comment above it is pretty clear you have no idea how evidence works in legal proceedings (laughingly clear, actually), or really any idea what evidence is. What about it. That's not the one I saw. The one I saw had the BC number blacked out. Either way, how hard would it have been to go to a computer at the DOH and print that thing up in a minute or two? Not very hard at all. I know people who have gotten fake BC's just like that. A little payoff money to the person who ptints them, and there you go. An official LOOKING BC for you to use. It is easy as pie. BTW, I was talking about the microfiche being scanned into the computer not the BC. No, they are not. Never have been. COLBs are abstracts of birth records and do not contain as much information as long form BCs. California and Texas COLBs are not accepted as evidence of citizenship for U.S. passport applications. prima facie presumption doesn't mean a damn thing. Look, all it would take is for a Hawaii official to go PRINT a BC for him. That's it! Just print the damn thing using a LEGAL template. It could also have been completely fabricated like the Kenyan one was. If that guy could make HIS BC look like one from Kenya with Obama's name on it, then this Hawaiian one would be a piece of cake considering there are NO signatures on any of it. Also, why is the BC number blacked out? Could that be because it is fake and that's the only way you could tell? What if that BC number was cross checked in the database, would it come up blank? Why is it blacked out? No reason for it to be. That is exactly what they did. Obama requested a certified copy of his BC, Obama received it and later posted it online. 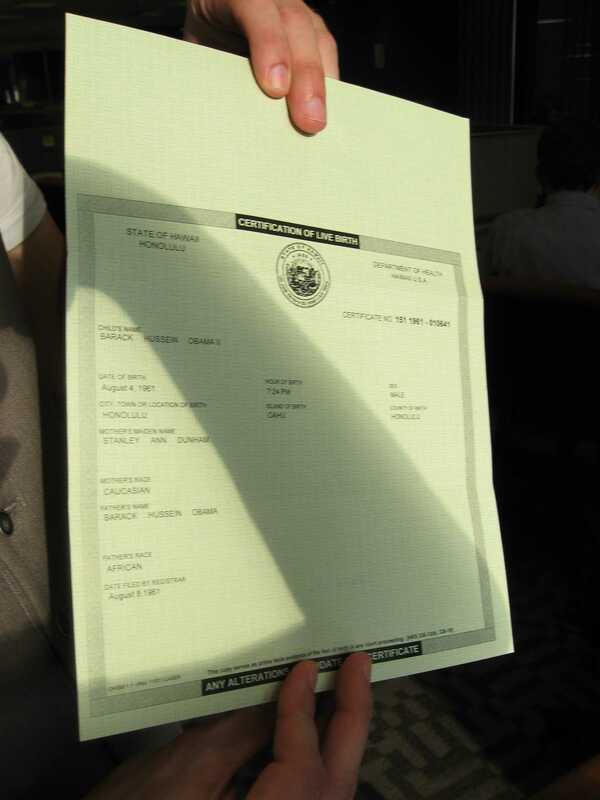 The certificate number was blacked out at the start because they were unsure if it contained any private info. A copy that is in someone's hand (from Factcheck) is posted above. No let him continue, I haven't laughed this much in ages! Looks like it was just printed yesterday........................ and it probably was! Now see, I wouldn't say you're being racist as you allege is the common accusation from the left. I'd say your just blowing smoke. Sorry about your legal ignorance, but prima facie presumptions are entirely sufficient as proof unless you have specific evidence to the contrary. Meaning, Obama's birth certificate is all he needs to prove he was born in Honolulu unless you turn one of your maybes, ifs or could'ves into something factual. Look, all it would take is for a Hawaii official to go PRINT a BC for him. That's it! Just print the damn thing using a LEGAL template. It could also have been completely fabricated like the Kenyan one was. If that guy could make HIS BC look like one from Kenya with Obama's name on it, then this Hawaiian one would be a piece of cake considering there are NO signatures on any of it. Could, could, could. Baseless speculation like yours here is meaningless. Also, why is the BC number blacked out? Could that be because it is fake and that's the only way you could tell? What if that BC number was cross checked in the database, would it come up blank? Why is it blacked out? No reason for it to be. Look one post up buddy. The Obama campaign first thought the number would have some personally identifying information that could be exploited, but they were informed that wouldn't be the case, so they had no problem with Factcheck not redacting the numbers. Hawai'is are prima facie evidence. Which means, basically, the burden of proof is on YOU to show that it is fake. Why is it funny? That statement in a PHOTOGRAPH means absolutely nothing. you just can't spin the possibility that it could be fake, which doesn't take a genius to figure out how easy it is to do so. All you need is money. Stop embarrassing yourself by divorcing your thought process from reality. Critical thinking involves understanding and accepting that there are OTHER possiblities to contend with. If there are questions unanswered, there will be skepticism. Look, all it would take is for a Hawaii official to go PRINT a BC for him. That's it! if that were the case it would then be in contradiction to the 1961 newspaper accounts and the index data entry.